Eyeing up the crux, no going back now. 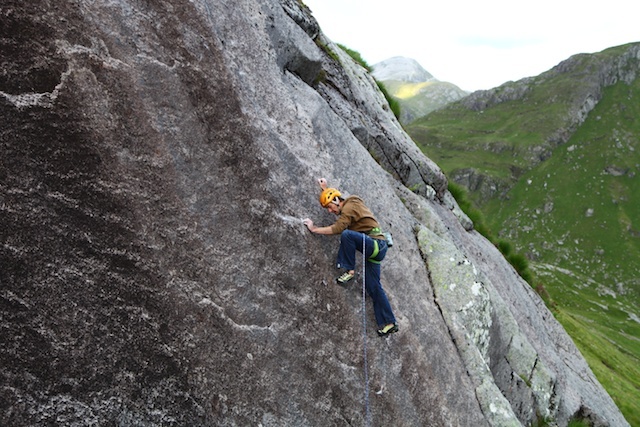 Pallor E7 6b first ascent on the Caldera slabs, Ben Nevis. Since my elbows finally got healthy last autumn, I’ve been on a mission to get strong and fit after three years unable to really train. I’ve been unleashing my keenness mainly the bouldering and sport climbing disciplines and although I’m still only part way through the process of getting where I want to be, I’ve had some good milestones. Part of a grand plan? Well sort of. Partly I’ve just missed pulling really hard on holds at my limit and now on a year long indulgence! 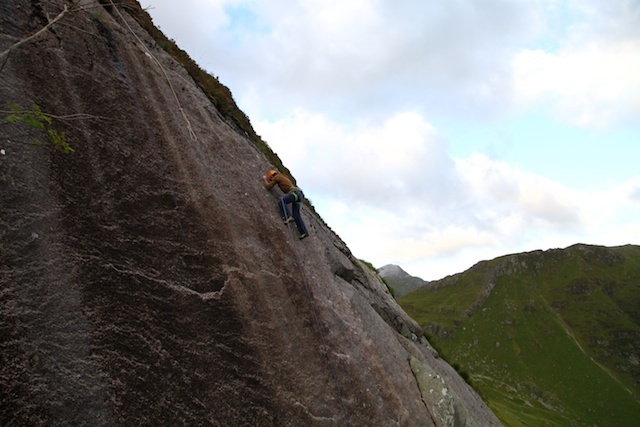 But partly I know that to build my climbing to another level it has to start with bouldering, then sport climbing, then I’ll have a good foundation to do something good on trad. With all this building a new base line I’ve not really climbed an unprotected trad route for ages. In fact I can’t really remember the last time. Yesterday we went to the Granite slab. 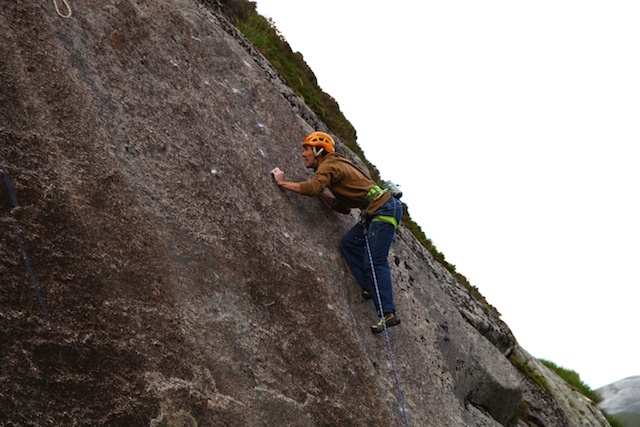 I was just going to belay Kev and have a play on the routes. But I still took my helmet and a pair of jeans, in case. In the end, I decided I might as well lead the first project on the slab. It feels rather hard for E7 given the height and absence of gear, but climbs just a little too easily to be happy to give it E8. So E7. I clipped some cams three moves up to stop my body rolling to the car park if I did decide to fall off and headed upwards. In the absence of recent trad experience I fluctuated in and out of the right mindset, having conversations with myself and becoming distracted (relatively speaking of course! ), then popping back into the flow for a few moves. Thankfully I flowed properly at the crux and watched myself carefully smear through and creep my fingers onto the finishing ledge. It was nice to remember why I do bold trad. It’s a demanding passion but excellent when you make the investment to do it right. I wondered if the good vibe would help me on my Steall project today. It didn’t. I wasted a fine chance with a belayer and a cold wind by fumbling the same move on two consecutive attempts and failing to get back to my highpoint. I can climb it in overlapping halves every session and nearly every try and even in not so great conditions. I’ve been here before - 95% good enough but exhausted all the easy channels of progress. I think I’ve hit a wall. My patience for acting like an amateur has run out. It’s time I got to grips with addressing the hard components influencing my performance that I’ve been avoiding. 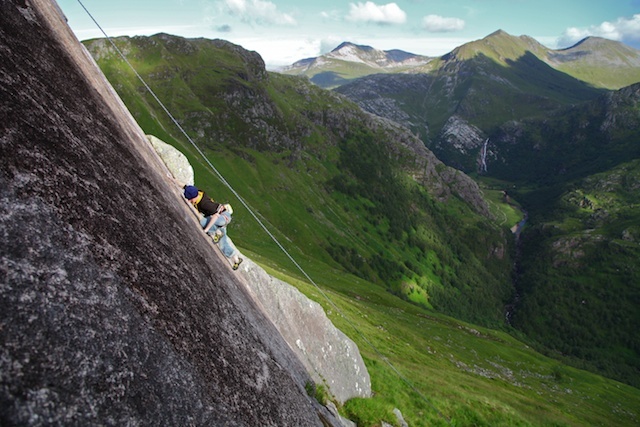 Kev working on the line, Steall gorge behind. Nice place eh?